When my dear friend and award winning baking book author, Flo Braker, passed away, the Bakers Dozen* group I belong to suggested each of its members bring one of Flo's pastries to our meeting as a tribute. Try to imagine two very long tables in Foreign Cinema restaurant crammed with every type of cookie, cake, pie, brownie and puffed pastry imaginable. At least 75 magnificent goodies--my sweet tooth was ecstatic. We could taste them there (I tried at least 15) and take home tastes of the rest. I came prepared with a huge Rubbermaid container that I filled to the brim. Once home, Karl and I proceeded to devour every single crumb in one sitting. To say we were in sugar overload would be to minimize our condition as we tossed and turned all night. Flo's generous spirit and amazing baking talent made her famous. Her recipes are foolproof, each one having gone through numerous testings and then explained precisely in her meticulous manner. It is a tribute to Flo that I have continued to use her amazing sour cream pastry throughout the years, because it is the easiest and flakiest I have ever tried. It was fun to retest the recipe to see if it stood the test of time. With very few changes to the filling, the tartlets are every bit as impressive and delicious as they were back then. The recipe also falls into my favorite cooking category, Prepping in Stages. The pastry needs to be refrigerated, so it must be made at least a few hours ahead, and it even freezes beautifully. I also like to make the filling ahead and chill it, because it is easier to spoon onto the pastry. If you are a perfectionist, then this may be the recipe from hell. If you can go with the flow and enjoy each tartlet as it bakes into its own unique design, then you will find yourself making these over and over again. You don't need to limit them to a mushroom filling--most fillings for filo (phyllo) dough work well. I have also filled them with lemon curd and cheesecake batter with great success. For all of us fortunate enough to know Flo, our lives are forever richer. * If you enjoy baking at any level and live in the Bay area, you might like to join Bakers Dozen. Check it out at www.bakersdozensf.com. Move the disk with a pastry scraper to a sheet of plastic wrap. Reduce the cream until the mushrooms become creamy and the sauce lightly coats the bottom of the skillet. I prefer a pizza cutter to cut the dough into 2 1/2-inch squares. Layer each of the squares over a muffin tin and top with a teaspoon of filling. Pull the corners of the square into the center and squeeze them together. Gently press into cups. 1. To make pastry,: In a food processor with metal blade or mixing bowl with electric mixer, process or mix flour, salt and butter until blended. In a small bowl, mix sour cream and egg yolk. Add to flour/butter mixture and process or mix until incorporated. Remove to work surface and shape into a ball. Divide dough in half. Flatten each half into a disk. Wrap in plastic wrap and chill until firm enough to roll. 2. 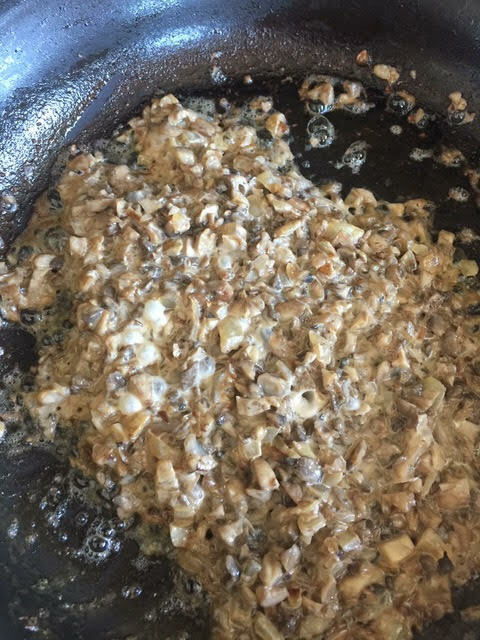 To make mushroom filling: In a large nonstick skillet over medium heat, melt butter. Sauté onion until soft and beginning to brown, 8 to 10 minutes. Add mushrooms, increase heat to medium-high and cook, stirring occasionally, until they release their liquid and it evaporates. Stir in cream and boil, stirring, until it has reduced into a thick and creamy sauce and is beginning to stick to the bottom of the pan. Stir in blue cheese and lemon juice. Season with salt and pepper. Cool completely or refrigerate. TO DO AHEAD: Filling can be refrigerated up to 2 days. 3. 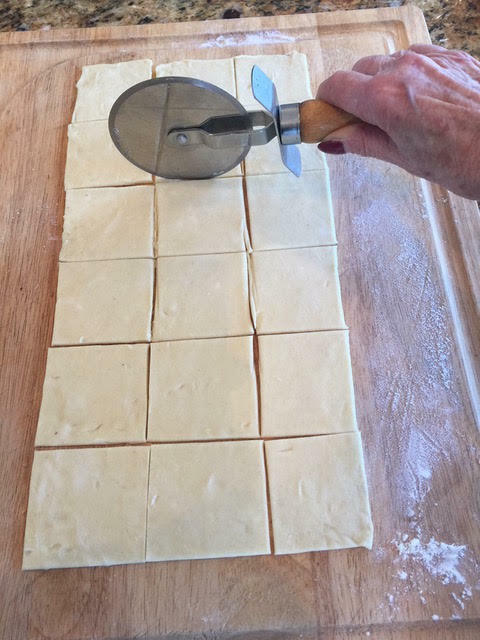 To assemble: On a lightly floured board, roll half the pastry into a 1/8-inch thick rectangle, about 7 1/2 x 15 inches. Cut into 2 1/2 inch squares. Place one square over the top of each ungreased muffin cup. Place one teaspoon of mushroom filling in the center of each square. Bring corners of pastry up to center, lightly pressing the center together. Gently push tartlets into muffin tins. Repeat with remaining pastry and filling, rerolling scraps to get 36 tartlets..
4. To bake: Preheat oven to 400°F. Bake for 25 to 30 minutes or until golden. Serve immediately or remove to racks to cool. TO MAKE AHEAD: Tartlets may be refrigerated overnight or frozen. Reheat at 350° for 10 to 15 minutes or until heated through.